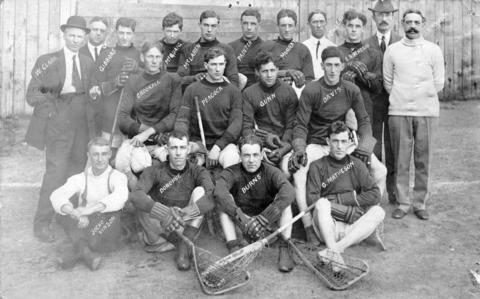 Item is a photograph showing the Vancouver Athletic Club Lacrosse Team. Pictured top row (L-R): W. Clark, Oppenheimer, McQuaig, McLaren, Painter, Murray, Fowler, E. Matheson, Unidentified, J. Reynolds. Middle row (L-R): Crookall, Peacock, Gunn, Davis. Bottom row (L-R): 'Jocko' Vinson, Donohue, Burns, G. Matheson.